Note: These tools are only for professional locksmiths/professional service providers. Photo ID proof verification is mandatory while purchasing this tool from us. PQ35 gateway 7N0907530AN: active MKE. after writing data record, you can set MKE on dashboard. MQB gateway 5Q0907530AJ: active MKE. after writing data record, you can set MKE on dashboard. PQ35 replace kessy 5K0959434B: before writing data, there's a DTC "no basic setting", the car can't find keys. After writing data the DTC disappear, the car can find keys. MQB replace kessy 5Q0959435A: before writing data, there's a DTC 10478040(invalid data record), the car can't find keys. After writing data the DTC disappear, the car can find keys. MQB front camera 5Q0980653G: before writing data, there's a DTC 0649 (invalid data record), after writing data the DTC disappear. MQB new ACC 5Q0907561A: before writing data, there's a DTC" invalid data record", after writing data the DTC disappear. PQ Xenon 5M0907273F: before writing data, there's a DTC 10478040 (invalid data record), after writing data the DTC disappear. 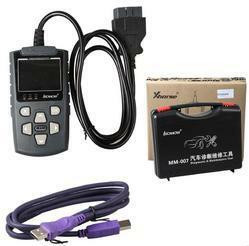 PQ tire pressure monitor 3AA907273D: before writing data, there's a DTC 12652550 (invalid data record), the controller don't work, after writing data the DTC disappear, you can set tire pressure on the dashboard. MQB new DCC 5Q0907376: before writing date, there's a DTC 813056 (invalid data record), after writing data the DTC disappear. MQB parking assistance 5Q0919298K: before writing data, there's a DTC 10478040 (invalid data record), after writing data the DTC disappear. There's a built-in database in the diagnostic tool. Users can write data record without online account. It has already supported many controllers, and more data will be continuously added.